Ice cream for Thanksgiving dinner? Wait, is that a swirl of gravy? Nov 22 Ice cream for Thanksgiving dinner? Wait, is that a swirl of gravy? It's a dog eat dog world out there in the food business and if you want to stand out, you've got to have a gimmick. And when it comes to ice cream, you really need something in this town to get noticed apart from all the local faves like Humphrey Slocumbe, Bi-Rite Creamery, Mitchell's, Mr. & Mrs. Miscellaneous, Smitten, Three Twins and Swenson's---just to name a few of the innumerable places to grab what has been a hot trend in SF for decades. 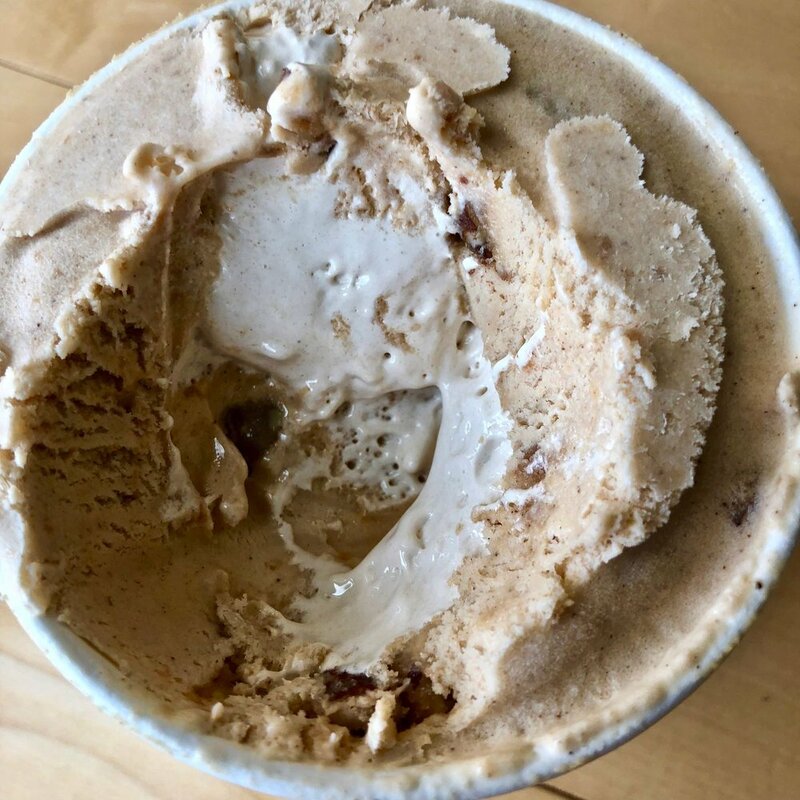 Kind of funny if you think about it since the weather in this town veers toward the cool, we are rather obsessed with the all things cold, smooth and creamy. Into to this frozen fray comes a new player all the way from the hipster bastion of the North, Portland, Oregon, called Salt + Straw. They've waltzed into town with not one, but two new locations to temp your icy sweet tooth. Outside of their industrial wood and steel locations, they are known for going the full on local, organic route but in a more noticeable ways by creating flavor combos you aren't going to get at your local Safeway. Things like roasted strawberries and tres leches, olive oil and lemon curd, honey lavender, peach vinegar cobbler and so on. They've only been open here a couple months now but they have definitely gotten themselves on everyone's radar with their current array of holiday flavors. By that I mean a whole meals worth of Thanksgiving themed ice creams to either tempt or turn your stomach. Of course I was intrigued by their attempts but when I mentioned it to the SO, they were like "YES! We gotta try them!" I complained (a little since you know I'm not all about the ice cream) that they were $11.50 a pint! Outrageous! They are like, "I'll pay," and I'm like "well, okay then." And thus I set out on a journey to their Hayes Valley location to gather a pint of each of their five Thanksgiving specific flavors so we could dish, try and generally marvel at what they were smoking when they came up with these. In order of appearance they would be: salted caramel Thanksgiving turkey, buttered mashed potatoes and gravy, persimmon and walnut stuffing, sweet potato casserole with marshmallows and maple pecans and spiced goat cheese pumpkin pie. Yeah, a lot of words and things going on here. Right off, just from the descriptions I can tell some of these may actually portend themselves to being quite tasty in ice cream while others are drawing a skeptical eye and tongue from both me and the SO. Still, they had a good idea that you could plate them up as your actual Thanksgiving dinner. Something that would make the SO super happy to dine on Thursday, so here they all are, plated and ready to eat just like a meal. Hmmmm, not sure they look totally appetizing as a dinner, but hey, at least they are all nice shades of autumn browns and yellows! How did they taste? Let's break them down one by one. Note, each starts with a base of plain vanilla ice cream and then adds ingredients to flavor up. The basics are all there and the ice cream is at least smooth and very creamy. 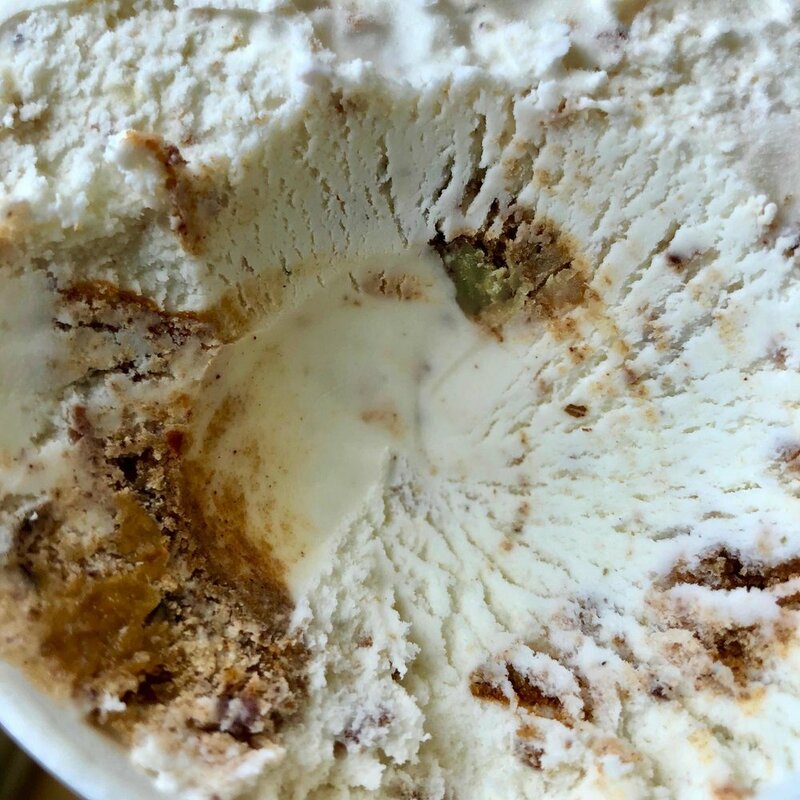 Salted Caramel Thanksgiving Turkey: this is the flavor that seems to have gotten the most traction across the media with it's supposed inclusion of turkey in ice cream. 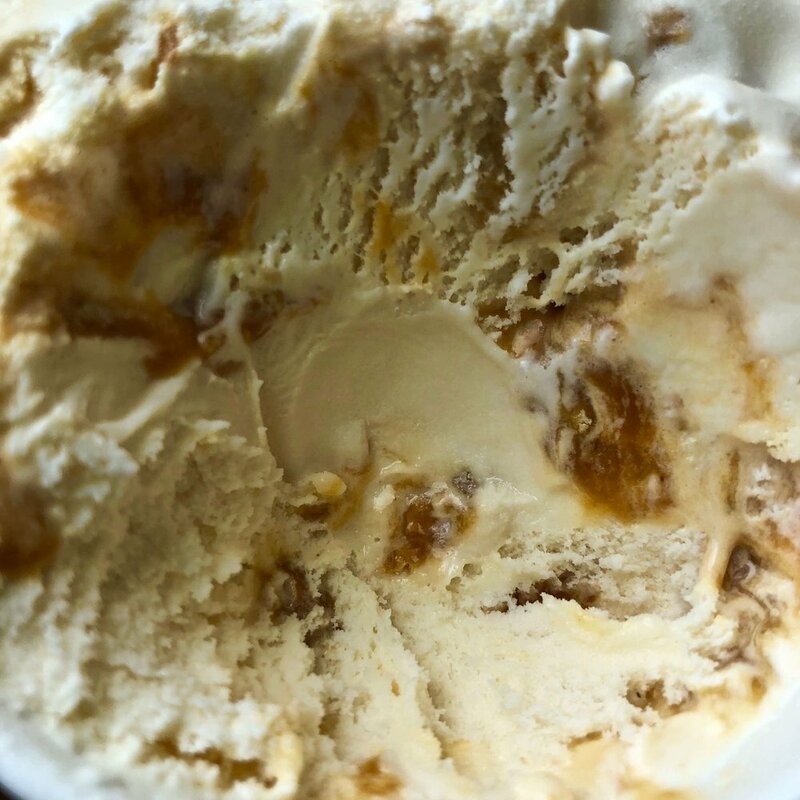 The strongest tastes are salt and caramel which are swirled throughout and not uncommon in ice cream in general. There are also crunchy bits of skin with a bit of candying on them and they add an interesting bit of crunch for sure that isn't too bad. Mostly what you get here is a salty sweet ice cream without much of a "turkey" taste which isn't bad or as weird as it sounds. In fact, when you check the ingredients, there is only turkey flavoring and some stock listed and it is actually crisped up bits of chicken skin not turkey. It really is about wrapping your mind around this idea as opposed to what is actually in here. Unique but not terrible by any means as some may have you believe. Not sure I could have this all the time, but for a seasonal thing, it is fun. Buttered Mashed Potatoes and Gravy: to me, this was the oddest of the flavors as opposed to the turkey. Mixed in are actual potatoes, butter and the ingredients to make gravy including stock, flour, seasonings, etc. Once you get past the top layer, there is a distinct swirl of real gravy running through it. I took a big spoonful to make sure I got it all and after rolling it around my mouth a bit to one thing that came to mind--it reminded me exactly of the mashed potatoes and gravy you get from KFC, just in a cold version. It was probably mostly the gravy which does it, but props to them for nailing the flavor. It isn't particularly sweet which helps push the taste forward. However, this one I found too bizarre to get on board with. Too much disconnect to wrap my tongue around thus a couple spoonfuls was enough and I'd take a pass on more. Persimmon and Walnut Stuffing: bits of walnuts, dried persimmons, raisins and breading are folded throughout but when you taste it, there also seem to be notes of cinnamon which makes it sweeter than you'd expect and not really stuffing like. My first thought was more of a Christmas holiday cake instead Thanksgiving stuffing which I consider a savory not a sweet. They could probably just carry this over. Next year, if they really want to go stuffing, they should try to do more savory like the mashed potatoes with some celery, onions and bread--forget the fruit. Decent as an ice cream, just not as a stuffing ice cream. Sweet Potato Casserole with Maple Pecans: Right off I'll say they nailed this one spot on. There are distinct sweet potatoes mixed in along with cinnamon, nutmeg, brown sugar and maple candied pecans. Plus, added bonus, there is marshmallow cream swirl throughout (see above) adding an extra smoothness to it I actually rather enjoyed. I was also a fan of the sweet crunchy pecans. If ever any ingredients are a match for ice cream, these are definitely it. Though adding them all makes this super, super sweet and could be sugar overload for some folks. Otherwise, I'd say this is the most appealing of the bunch from a pure ice cream stand point and could easily be a year round thing if they wanted it to be. Spiced Goat Cheese Pumpkin Pie: well, it definitely had some pumpkin flavor in it along with the usual suspects of pie spices though or maybe fortunately, it didn't have that weird orange color some "pumpkin" flavor things have. There is real pumpkin puree in there according to the ingredient list. The surprise here was the addition of spiced goat cheese which made this not particularly sweet. Odd considering pie is a dessert but the sweet potato casserole was sweeter than this one. Me and the SO were a little torn on this. The cheese changes up the texture some making it feel thicker. Plus the flavor seems a little off. Again, I think it is a mind/tongue disconnect about cheese and ice cream, while both diary things, together they don't necessarily mesh as well as want to think they should. Goat cheese can be strong and sometimes overwhelm the pie aspect. Maybe up the spices or replace the cheese with cool whip? Eh, just a suggestion. Not sure this was a total success as is. That was definitely a lot of dairy to have in one sitting--glad we aren't intolerant!! Yes, we tried them all at one time so we could the "essence" of an entire Thanksgiving dinner. You know, research and as with most food things, a bit of hit or miss for both of us. The "turkey" one not as off putting or bad as you might initially think and the stuffing and casserole were quite well suited for ice cream. The mashed potatoes and oddly enough, pumpkin pie, not exactly something we'd go back for. But give Salt + Straw a little credit, they are doing something different and getting noticed for it. As I said at the beginning, to stand out in the crowded ice cream field of SF, you need a gimmick and look, here I am falling for all of it. While I can't say all of them were taste successful for us, we did buy a pint of each so props to them for making us want to buy and try. Ultimately, isn't that what all businesses strive for? Now let's see what they do for Christmas. Nov 28 Southern food galore! In The Mission? Nov 20 Is this what you are having for Thanksgiving?! I've got some better ideas!